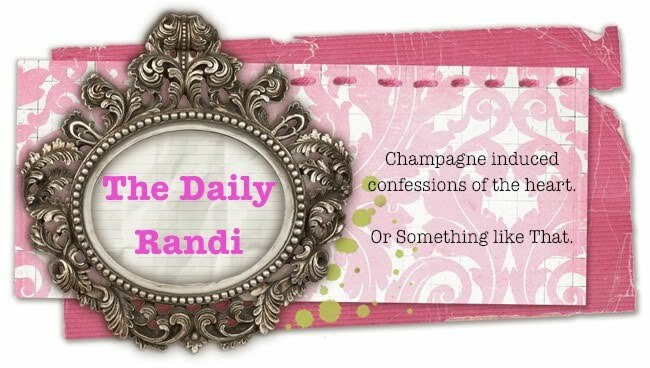 The Daily Randi: We Interrupt Our Regularly Scheduled The Daily Randi Programming To Bring You This Important Message. We Interrupt Our Regularly Scheduled The Daily Randi Programming To Bring You This Important Message. There. I Said It. No, I don't (Thank God) have Cancer. But, My Good Friend, Supermodel Cindy does. She has Ovarian Cancer. Supermodel Cindy has appeared in The Daily Randi before. She is the person who I stay with when I go back to Manhattan to see my old friends. Supermodel Cindy and I met when we worked at A Very Popular Theatre District Restaurant in New York City. We were both Servers and worked there for Years. The Owner of The Very Popular Theatre District Restaurant was Very Easy To Work For, so there was Very Little Turnover amongst The Waitstaff. As a result, we all became Quite Close. To this day, even though it has been nearly seven years since I relocated to Los Angeles, Everyone we worked with Very Willingly shows up at a bar to see me when I go back for A Visit. Well, maybe that is All Because It Is Me. Or, maybe we just All Really Like Bars. When Supermodel Cindy called me in late April to inform me that she had just been diagnosed with Ovarian Cancer, I was understandably Upset. After I reassured her I Was Sure Everything Would Be Fine, I hung up the phone and Googled The Disease. I knew a bit about Breast Cancer, but not So Much about Ovarian Cancer. Well, except that I knew that Gilda Radner had Died from it. After I read my Googled Results, I understood a lot more -- Ovarian Cancer does not have A Good Survival Rate. Supermodel Cindy has been doing Chemotherapy, and she tells me that her Prognosis, while not Perfect, is still Good. But, unfortunately, Supermodel Cindy has not been able to Work. Being a Super Model, well, A Successful Plus Sized Model, her Looks are her Selling Point. But, Supermodel Cindy has Lost All Her Hair and has not been Feeling Well, due to her Treatments. So, Work wasn't really Happening. When I would call to Check In on her, she would sound Super Down. She didn't know how she was going to pay her bills. No longer working as A Food Server, she freelanced as a Make-Up Artist for A Giant Cosmetics Company in between Modeling Jobs. But, no one wants her make-up done by A Cancer Patient. Unless it is like A Charity Event or something. Desperate for Money, Supermodel Cindy invested in A Pricey Wig. Anxious to show off her New Pricey Wig to her Agents, in the hopes that they would Start Sending Her Out For Jobs Again, Supermodel Cindy marched into their office and reminded them she was (Literally) Still Alive. "The New Pricey Wig looks Really Good!" they told her. But, Supermodel Cindy felt her visit was to No Avail. A few days after this visit, Her Agent Called Her, though. "Supermodel Cindy? We just received this breakdown for A Big Giant National Ad Campaign involving Pantene Shampoo And Cancer. They want someone who has No Hair." At first, they couldn't get Supermodel Cindy in for The Audition. The Agency was Too Late in submitting her. But, eventually she got in. During The Audition, all the Emotions she was feeling throughout her treatment and had Stifled came Rushing Back to her and She Booked The Job On The Spot. Now, not only could she Pay Her Bills, but she also was Helping A Cause that was Extremely Important To Her. And that is The Irony Of Life. The Commercial is part of Pantene's Beautiful Lengths Program, inspiring women and men to Cut Their Hair to make Wigs for people suffering from Cancer. Last week, Dianne Lane cut her hair on The Today Show as part of the crusade. You can learn more about Beautiful Lengths and see Supermodel Cindy's Amazing Commercial at www.beautifullengths.com. And maybe Supermodel Cindy will Inspire You the way she has Inspired Me. Not that I am about to Cut My Hair or anything. But, well, You Know. What a wonderful post! Great way to start a Friday. Nice commercial. Great post, Randi. Wow, what a moving and wonderful post. The commercial is beautiful and sad, it really touched my heart. I pray that Cindy makes a full recovery.